Four tips to buy a portable evaporative cooler • The Air Geeks, reviews of air conditioners, dehumidifiers and air purifiers. If you are looking for a reliable air cooling solution for your home, then you have many options to choose from. You can decide to go for a central air conditioning unit, portable air conditioner, spot cooler or an evaporative cooler. Although all these products are designed to transform your room into a place of comfortable environment, they offer different performances and you should consider your cooling needs before selecting a particular option. Evaporative coolers are cost-effective and they offer impressive energy efficiency. In case you have already decided to go for a portable evaporative cooler, we have gathered the key tips that you should consider when buying one. To achieve the desired environment, you should select an evaporative air cooler that is recommended for the size of your space. If it is smaller than the recommended size, the cooling solution will not be able to achieve the desired results within the expected time. On the other hand, if you select a high capacity portable evaporative cooler for a small room, the system will waste energy thereby lowering the overall efficiency. The effectiveness of an evaporative cooler is determined by the climate of that location. This means that this cooling solution is not suitable for some locations. 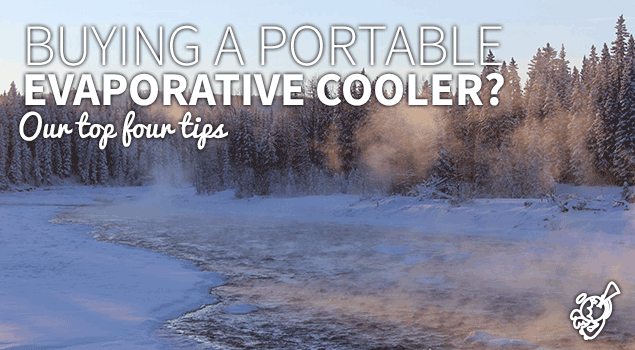 Portable evaporative coolers utilize evaporation process to cool the air in your room. As such, they are best suited for hot and low humidity climates. These air cooling solutions perform poorly in warm environments that have high humidity. If you live in such an environment, then you need to consider another cooling solution such as a portable air conditioner or a central air conditioning unit. You can either buy a portable evaporative cooler or a window mounted unit. In case you are looking for a cooling solution that you can easily install and move from one part of your room to another, then you should go for a portable system. However, if that is not the type of cooling unit that you are interested in, you can select a window mounted unit. Your cooling needs should guide you to select the best cooling solution. Before selecting any appliance, it is important to clearly understand its maintenance needs. A portable evaporative cooler has minimum maintenance requirements. If you maintain it properly, this cooling solution can serve you for a long time without any problems. The unit should be cleaned periodically to remove dust and other dirt particles. For best performance, the filter should be cleaned after every two weeks. After considering the above factors, you will be able to select a cooling solution that is best suited for your cooling needs.